The 2003-2004 Range Rover equipped with the BMW system has many hiden service modes that are not detailed in your owners manual. Resetting the Oil Service or Service Interval Message. Ignition key must be “off”. • Press and hold the trip odometer button in the instrument cluster (left button), and turn the ignition key to the first position (KLR). • Keep the button pressed for approximately 5 seconds until one of the following words appear in the display: “OIL SERVICE, or “INSPECTION”, with “reset”. • Release the reset button and press and hold it again until “reset” begins to flash. • While the display is flashing, press the left button briefly to reset the service interval. After the display has shown the new interval, the following will appear: “END SIA”. • Press and hold the Check Control button in the instrument cluster (RIGHT button), and turn the ignition key to the first position (KLR). * You will first see "Check Control OK", some seconds later you will see "Test Nr.01"
* Push the right button until you see "Test Nr.19"
* Press the Right button to select. 6. Remaining fuel in tank. Three sets of numbers: A/B/C. C=total amount. Did you know that you can roll down the windows by holding the unlock button? Did you also know you can roll them up by turning the key in the door to the right and holding in this position. Did you know you can turn the DSC into Competition Driving Mode. Press and hold the DSC button for 10 seconds until the light goes out on the dash. This mode gives you active handling via the brackes but NO throttle managerment when DSC engages. It is also good for snow/ice operation when you want the tires to spin. Replacing a missing master key is quite expensive from Land Rover, try not to get sucked into the extra cost of "Dealer coding" You can do this yourself in 2 minutes by following the simple process below. 1) Get in and close all doors. Turn ignition on and off quickly and remove the key (all within about 5 seconds). 2) Within 30 seconds of turning the ignition off, while holding down the "unlock" button, press the "lock" button three times. Release the "unlock" button. (You may or may not get the confirmation from the door locks.) Holding the key at your head level provides best results as the key sensor is in the side window pillar. 3) Repeat for each key you want to initialize within 30 seconds after the last one you initialized (if you have more). 4) Right after doing the last key, quickly put the key back in the ignition and turn it on/off again to finalize. You can arm the alarm while turning off the interior motion sensor and the tilt sensor simply by hitting the lock button twice within 10 seconds or turning the key in the door twice to the right. You can monitor the red led on the mirror when locking to be sure you set it in the correct mode. When you deactivate the interior sensors (with that second push of the key, or second turn of the lock) then the LED goes solid red for 2 seconds before starting to blink. You can roll down all the windows and open the sunroof simply by pressing and holding the unlock key. In Europe you can use the lock key to roll the windwos up. It is possible to set the Rover key programming to roll the windows up as well, but it would require a "smart dealer" to program. And we all know how many of those their are. Our Online store sells the Range Rover Bluetooth retrofit kits and other BMW products specific to your Range Rover. As described in this document, position R is the key in the turned in the ignition to the furthest most part without starting the vehicle. The function option allows you to verify Key functions on the navigation display, or modify the brightness of your display. Using the Functions Key also allows you to view your GPS Satellites that are currently being detected and used. 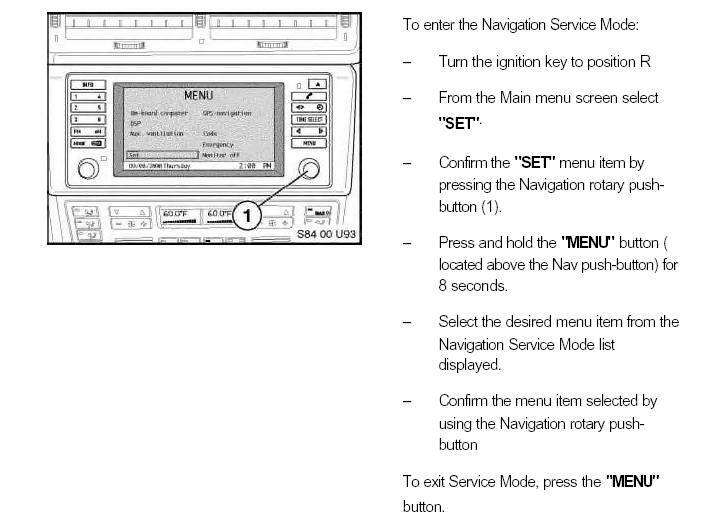 Telematics setting details information contained in your Navigation computer that is transmitted back to the service center when the EMERGENCY menu option is used. By far the best setting that you can adjust the look of the 16:9 display is to turn off the Day/Night Feature of the MKII software. BMW nuked this feature in the MKIII hardware as it just does not work very well. Below is the way to turn off this feature. -Thanks for the pictures Todd E.!